Ease the concern of children who may be tactile defensive, or who do not want to get messy, by protecting their hands with latex free gloves when spraying the paint. Do you like to spray paint? Debbie Glicksman of Los Angeles created a beautiful challah cover (shown below). Isn't it lovely? 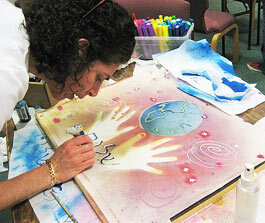 The cover began with me spraying her hands with watercolor as she held them over her fabric. You can adapt the same process easily with children. First, gather white fabric scraps or yardage, stretch over rolled up newpapers and secure with pushpins to create a smooth working surface, then get out Colorations® Liquid Watercolor in spray bottles and begin to play. Use your hands as stencils and add other stencils you make yourself by cutting shapes out of file folders. Finish by adding details with puffy paint or permanent markers. When you paint with Colorations® Liquid Watercolor remember that it's a completely washable paint, so think fabric wall hangings and process oriented art. This is a great project for outdoor art while the weather is warm.